Unfortunately, the result looks a bit odd. In order to keep the production simple and the price low, the Tesla Model 3 doesn't have a large variety of options. The only things that buyers can even choose from on the Model 3 is the color and the wheel size. One of the optional wheel sets is the Aero Wheel design, which is said to increase the car's range by around 10 percent. Increasing an EV's range isn't easy, and typically requires added battery capacity or a software update. 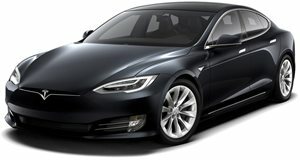 One Model S owner in the Tesla Motors Club thought that he could modify his wheels to increase the range of his car. The owner says that the idea came during a visit to a Tesla service center in Vancouver. The employee there said that the smaller, 19-inch wheels were more efficient than the 21-inch wheels because they had a flatter face. The owner then began this DIY project of creating a cap to fit over the 21-inch Model S wheels, which could increase the car's EV range. The wheel covers aren't completely DIY because the owner had a CNC shop machine four brackets to attach polycarbonate dishes over each wheel. All together, the owner spent around $1,250 on all of the required hardware, which certainly isn't cheap. But do these covers actually work?